Elijah Wood, Courteney B.Vance, Robbie Coltrane, Jason Robards, Ron Perlman, Dana Ivey, Anne Heche, James Gammon, Tom Aldredge, Curtis Armstrong, Frances Conroy. There have been several cinema adaptations of Mark Twain’s story, The Adventures of Huckleberry Finn. One of the most notable was that of the 1930s with Mickey Rooney, very much at home in the central role. There was a musical version with Jeff East in the 1970s. 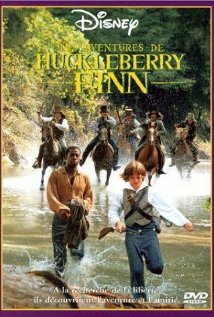 This is a film of the 1990s, given the lavish Disney Studios treatment, with a very strong cast of character actors and Elijah Wood, in one of his earliest roles, showing his great acting talent in the role of Huck Finn. He was to make a number of films during the 1990s, showing talent, for example The Good Son, with Macauley Culkin. While he was to appear in quite a number of films and the television series, Wilfred, he made his mark as Frodo in the The Lord of the Rings cycle. The film sets the scene on the Mississippi in the 1830s, society, poverty among whites, and the slavery of the blacks. Courteney B.Vance is sympathetic as the slave, Jim, wanting his freedom and accompanying Huck on his adventures. Ron Perlman plays Huck’s hikes father, a threatening and abusive man. As with the other film versions, the two rogues, the King and the Duke, team up with Huck and Jim, pretending to be the brothers of a dead man, intending to rob the dead man’s nieces of their fortune and sell their house. They are played with a rollicking enthusiasm by Jason Robards and Robbie Coltrane. It also gives the opportunity for Elijah Wood to show his talent, pretending to be their valet, and toying with British accent and style. In the Disney context, the film shows a great deal about slaves, the prevailing attitudes of the time, even Huck talking down to Jim in various crises. There is happy ending, Huck reinstated, Jim given his freedom, and an enjoyable experience of Twain’s story. 1. The popularity of Mark Twain’s story? The 19th century is? The popularity of the characters, especially of Huckleberry Finn? 2. 1990s version, Disney, colourful, locations, characters, serious, comic? In comparison with previous versions? 3. The 1830s, the American South, the town, homes, slaves, in the fields, in homes? Slavery taken for granted? The criticisms of slavery? 4. The river, the river boats, the sequences on the river, the river’s importance? 5. Elijah Wood as Huckleberry Finn, his talent as a little boy actor? His background, his absent father, his father’s return, mockery and threats? The news of his death? Huck and the two sisters, their looking after him, fussing about him? His friendship with Jim? His friendship with the boys, the glimpse of Tom Sawyer? The fights and Huck being roughed up? 6. The aftermath with his father, his deciding to go? The plan with Jim? Escaping with Jim, Jim accused of murder? His being hunted? 7. Huck and Jim on the water, their encounters, sailing past their destination, the return? 8. Jim, as a slave, his background, his family, wanting freedom? Good to Huck? Yet Huck and his sometimes haughty reactions, Jim is a slave? 9. The encounter with the King and the Duke? The characters, rogue is, unscrupulous? The chance encounter with the man from the town, telling the story, the death of Peter Wilkes, his brothers coming, the inheritance? 10. The plan, the King and his becoming a preacher, the Duke and his posing as death-mute? Huck as their valet? Jim and his alleged African background, costume, false Swahili? 11. The sisters, their grief, Susan and her suspicions, taunting Huck? The pretences, the meals, the King holding forth? The people of the town, welcome the brothers, believing them? 12. The will, the money, the two seeking out the chest, Huck overhearing, taking the bags, putting them in the coffin? The rogues and their plan, to take the money, December house, to get rid of the sisters? 13. The real brothers turning up, people not believing them? The tests, the marks, the crowd turning on the real brothers? 14. The Dr, his continued attack on the rogues, denouncing them? 15. Huck, his plan, warning the sisters, Jim being arrested, going to the prison to free him? Jim and his almost being lynched? Being rescued? 17. The recounting of Mark Twain’s story and the dramatising of his themes?